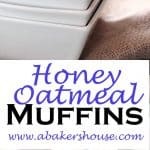 Honey oatmeal muffins are a hearty muffin for your morning meal, snack, or afternoon tea. 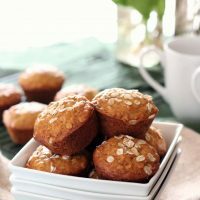 Oatmeal is such a popular way to start the day and adding oats to a muffin is nice way to incorporate this ingredient into your breakfast baked goods. I found this recipe on the Food and Wine website; apparently the recipe was inspired by the bee hives at the White House. When the #Breadbakers announced that Oatmeal Breads would be the theme for July I knew I wanted to give these muffins a try. My only changes were to use all white flour rather than whole wheat since that is what I had in the pantry and I also omitted the cardamom but added a touch of nutmeg. These were best fresh and warm right out of the oven but my parents kindly ate them the day after baking. A pat of butter or dollop of honey would be a good idea especially on day two. Next time I’ll freezer half of the batch and then heat them one at a time as needed. The smell of honey and oatmeal baking in the oven was indeed welcome even on a summer’s morning so recreating that feeling with the aid of the freezer would stretch out the enjoyment for sure. Looking for another recipe that highlights honey? Try these Honey and Vanilla Madeleines. Or what about oatmeal recipes? Here are more oatmeal ideas: Holiday Oatmeal Cookie Mix, Maple Oatmeal Bread, and one of my favorite- oatmeal fudge bars. 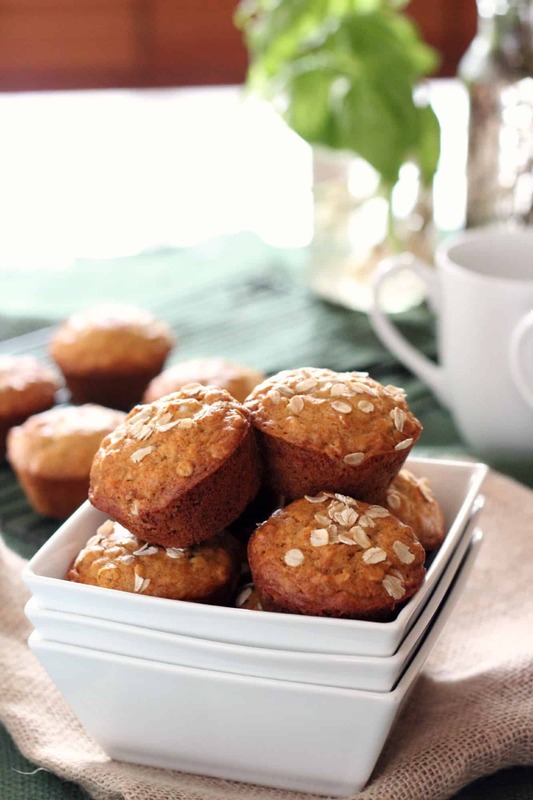 Honey oatmeal muffins are a hearty muffin for your morning meal, snack, or afternoon tea. Please find the original recipe here. This month our baking group was led by Rocío at kids & chic, many thanks!! If you are a food blogger and would like to join us, just send an email with your blog URL to foodlustpeop[email protected]. #BreadBakers is a group of bread loving bakers who get together once a month to bake bread with a common ingredient or theme. You can see all our of lovely bread by following our Pinterest board right here. http://www.pinterest.com/flpl/bread-bakers/ Please enjoy these Oatmeal Breads shared below. Oh how one of those muffins would be so great with my coffee right now. Nutmeg is always one of my ‘secret’ ingredients. You made a good call in substituting for the cardamom. The muffins look great! In the middle of the week I always seem to run out of breakfast food. Going to try this out and then I’ll have some in the freezer when I need! Very nice and delicious muffins indeed. I was waiting for this post, Holly! These would be perfect for my teen to grab and go during the week! Love it! These muffins look amazing! I make muffins a lot to go with ur dinners, and love having another one in my arsenal! I love having muffins in the freezer for those busy mornings when you want to hand the family something warm and nutritious as they head out the door. Those are the cutest muffins ever! I always have some sort of slice of bread, bagel or other baked treat in the freezer ready to thaw for breakfast! My husband is an oatmeal lover. Every morning, full stop. I bet he’d love some of these for a change and I’m off for the next week and a half. These go on the to do list for sure. Love the idea of muffins. Honey and oatmeal are a great combination. I love muffins and don’t make them often enough! The combo of honey and oatmeal is perfect. Great choice! Holly, these are such beautiful muffins! I love introducing healthy stuff to my kids and these would make such a healthy and tasty snack option! Wow! these muffins have turned out beautiful. These muffins look fantastic.. Would be great for with tea or coffee..
Muffins are the best for breakfast, aren’t they? Fresh from the oven, with or without butter. And so portable! 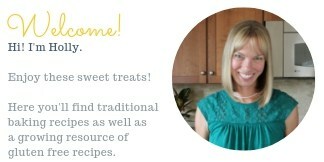 I love your honey oatmeal muffins, Holly!